A tire blowout is one of the most frightening experiences motorists can have behind the wheel. Caused by a flat, severely damaged, or defective tire that suddenly loses all air pressure—often sending the vehicle careening out of control—tire blowouts are a leading cause of serious accidents and injuries, including large truck crashes. Flat tire and blowout-related accidents were even more common prior to the introduction of tire pressure monitoring system (TPMS) technology. In fact, flat tires and blowouts caused an estimated 78,392 crashes, 10,275 injuries, and 414 fatalities each year in the United States before TPMSs became standard on most vehicles, according to the National Highway Traffic Safety Administration (NHTSA). When a tire blowout occurs, knowing how to respond and maneuver the vehicle to safety can prevent injuries and even save lives. However, avoiding a blowout-related crash is not always possible—especially when the person experiencing the blowout is another motorist or a commercial truck driver. If you were injured in an accident caused by a tire blowout that occurred due to a defective tire, you may be eligible for compensation for a wide range of damages. 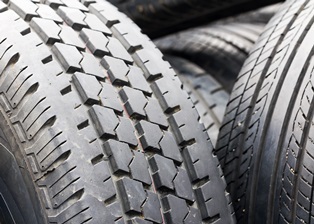 While not all tire blowouts can be prevented, some can be avoided with proper tire maintenance practices. Most newer vehicles have internal tire pressure gauges, allowing motorists to monitor their tire pressure from their dashboard. For vehicles without internal pressure gauges, safety experts recommend that motorists check the pressure in their tires a minimum of once a month, as well as before long road trips. Comparing the tire pressure reading to the ideal pressure specified in the vehicle's manual and correcting the pressure, if necessary, can help motorists avoid unpleasant and potentially dangerous blowouts. When checking tire pressure, experts also recommend checking the tires' grooves for excessive wear. Ensuring that tires have sufficient traction can be a life saver, as it can help prevent flat tires that can lead to blowouts. Always drive with both hands on the steering wheel. Never hit the brakes or abruptly take your foot off the accelerator. Maintain current speed if possible as the vehicle loses traction. Release the gas pedal gradually. Correct steering to stabilize the vehicle and regain control. Steer into the skid or determine where you want to go and steer the vehicle in that direction. Slow down as the vehicle stabilizes. Pull over to a safe spot on the side of the road and set up flares, flags, or emergency triangles. Contact a tow truck operator and call for medical assistance, if needed. If you were injured in a car or truck accident caused by defectively designed or manufactured tires, you may be able to hold the at-fault party responsible for damages such as medical expenses, property repair costs, lost wages, pain and suffering, and more. The experienced product liability attorneys at the Morris James Personal Injury Group can help you explore your legal options and fight for the compensation you deserve. Contact the Morris James Personal Injury Group today to schedule a free initial analysis of your case.